In addition, we offer a newsletter via email, also free of charge – please use the contact form to order it. News on Global2015 will come as needed and quite irregular. But with having subscribed to our web feed or newsletter you will get the latest news up to date. What are the Differences between the Web Feed and the Newsletter? News contents are the same. But you can register a web feed and get news on Global2015 without disclosing your e-mail address. To stop receiving the news you don't have to send a message for unsubscribing. Receiving news is completely under your control, because like visiting a website it's driven by your demand and activity only. These are advantages compared to receiving a newsletter via email. How to register the Web Feed? If you see at the top of your browser one of these icons: or (within the toolbar, or within the web address field [where you type in URLs (Uniform Resource Locators) like www.global2015.net] at the left or right end) – click on it for bookmarking our news feed. Or copy one of the link addresses above having the orange icon into a special feed reader programme. or Microsoft Internet Explorer 7.0 (using the Favorites/Feeds section). 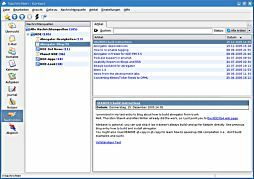 There are also special programmes for feed reading like Akregator, AmphetaDesk, Feed Demon, FeedReader, Flock, NetNewsWire, Newsgator, RSSOwl, RSSReader, or SharpReader. Email client Mozilla Thunderbird has a feed reader feature, too. Furthermore, there are web-based feed readers which offer a compilation of different news feeds or let you make a compilation of your choice. A web feed consists of headlines and a hyperlink as well as other, optional informations for each headline: date of article, a summary and/or the entire article, author or other metadata, sometimes a thumbnail image, etc. (and so on) But which is displayed depends on the software used. Web feeds are designed to be machine-readable rather than human-readable, which tends to be a source of confusion when people first encounter web feeds. If you access a web feed like a web page with your browser, you may get only a bunch of source code (or your browser asks you what to do with this file). Using a feed reader or the respective feature of a recent browser will do a better job. After subscribing, everytime you are looking for news your feed reader or browser will check for our latest news. (In your browser just look at the bookmark for the Global2015 feed.) You determine when our web feed will be accessed. There are probably settings for automatic checking in your programme. If you want to stop receiving our news, just remove the bookmark or link within your feed reading software. Subscribing and unsubscribing takes only place within your software, we are not involved in it, except that somebody unknown is downloading our web feed file.